The only widebodies Aeromexico currently flies are 787s (they retired their 777s earlier this year). 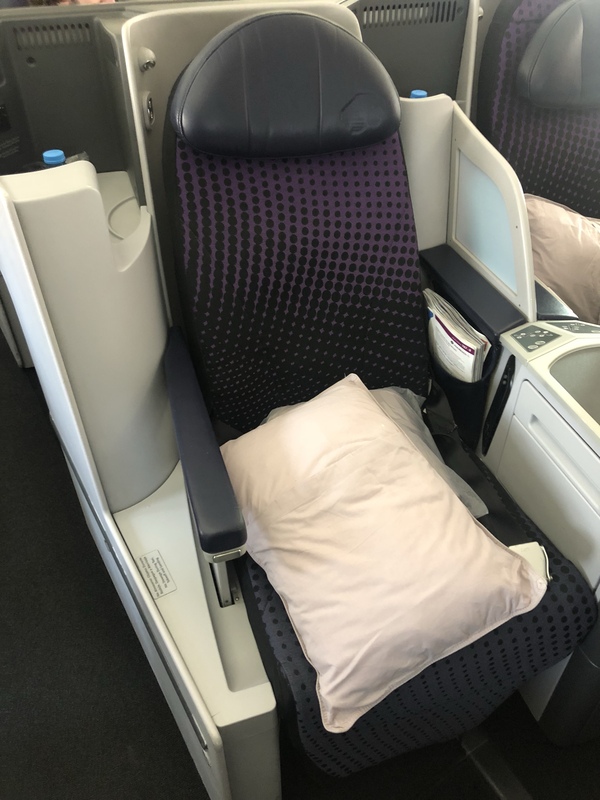 They fly both the 787-8 and 787-9, and this is a review of the business class product on their 787-8. Before flying this 787-8 from MEX to SCL, I flew on one of their 737-800s from JFK to MEX on a red eye. It was very similar to a domestic red eye in that the 737-800s feature recliner seats in business class. Not fun for a ~4.5 hour flight. Luckily, the business class product on the 787-8 is much better. It’s a lie-flat product in a 2-2-2 configuration. There are 4 rows of business class in the main cabin, and 1.5ish in the rear cabin. The seats are not industry leading, but they do go lie flat, so I won’t complain too much. The bulkhead seats have a larger foot cutout, so I would opt for one of those if available. The seats are on the narrow side and don’t have much storage. Waiting at my seat were a water bottle, headphones, a pillow, and blanket. The pillow and blanket were pretty decent and fluffy. Pre-departure beverages of water, juice, or champagne were offered, and then amenity kits were handed out. The refreshment service was served about 40 minutes after takeoff. The tamale my seatmate had looked pretty good. My vegetable sandwich (a pre-ordered special meal) was decidedly less appetizing. It was bread, refried beans, and vegetables served cold. But I enjoyed the fruit on the side, and I liked that they had coconut water as a beverage option. Midway through the flight, they set up a snack trolley between the front and mini business class cabins. This didn’t happen until pretty late in the flight (probably around 4-4.5 hours in), so it’s not just available after the first meal service like snacks are on other carriers. They had apples, pears, potato chips, packaged cookies, Twix bars, sliced vegetable (carrots, jicama, and celery), and mini croissant sandwiches. One thing to note about the IFE on this flight was that it was censored. I watched Three Billboards Outside Ebbing, Missouri, and all of the swear words (of which there are many) were dubbed over. About two hours prior to arrival, they served the main meal service. My special meal was actually pretty tasty: it was a lightly flavored rice dish with some vegetables. I’ve had many much worse special meals on flights. And for good measure, here are the menus (and special meal) from the flight back from SCL to MEX. This flight is a red eye with the main meal service after takeoff and a smaller meal service prior to arrival (although I don’t think many passengers took advantage). My meal wasn’t as good as the one on the flight from MEX to SCL, but it was still fine. Overall, I’d happily fly Aeromexico again. Their lounges in MEX leave a lot to be desired, and the 737-800s are to be avoided, but the hard product on the 787-8 is perfectly comfortable, and the service was fine as well (it was significantly better on the flight from SCL to MEX). I would recommend trying to get a bulkhead seat (first row of main cabin or mini-cabin) so you have more room for your feet. This entry was posted in Aeromexico, Travel, Trip Reports and tagged aeromexico, boeing 787, flight review, travel, trip report on May 14, 2018 by Edward.